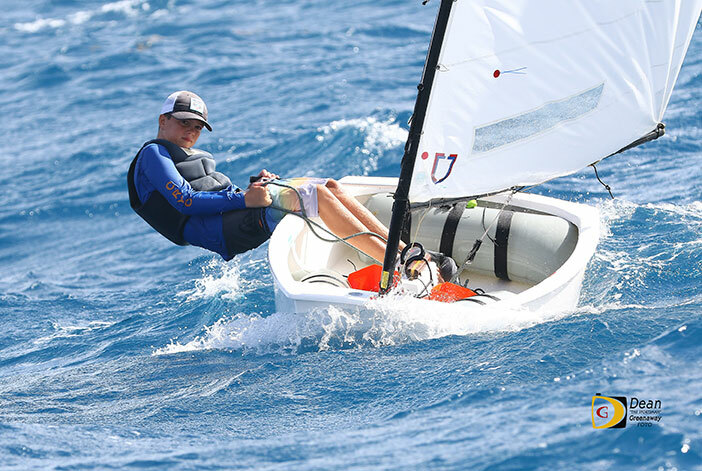 In the first youth sailing event since last year’s version before Hurricane Irma wiped out September’s Back to School Regatta, sailors from St. Thomas and Puerto Rico joined their BVI counterparts in the annual BVI Dinghy Championships held in Nanny Cay. The early battle for the top spots in the Optimist Championships Division, was between sailors from the St. Thomas Yacht Club, trying to claim the vacant title sleft by counterpart Mia Nicolosi, who aged out of the competition, after dominating the event over the last three years. Saturday’s opening day saw seven races and eventual winner Tanner Krygsveld who retired in the first race after capsizing, storming back with three bullets and a second place finish, for a one-point lead over teammates Andy Yu and just two better than Katherine Majett. Krygsveld tallied 12 points, Yu 13 and Majett 14, heading into Sunday’s final day of action in the small field of Blue and Red Fleet sailors that also included a participant from Puerto Rico, sailing just off Nanny Cay. Krygsveld won two of four races on Sunday to seal the title with 21 points. Inconsistency by Yu and Katherine Majett who eventually retired and was overtaken by her sister Winn, prevented them from capitalizing on Krygsveld fourth place finish in one of the races. Yu finished second with 26 and Win Majett third, with 38. Capsizing during the first race of the competition, Krygsveld said it was no point going on as he was already behind the start. Event coordinator Tamsin Rand, said it was a fabulous weekend and the weather gave everyone a challenge, but it was great having the St. Thomas sailors along with one from Puerto Rico. With the strong winds on opening day, organizers had the Green Fleet competing inside Nanny Cay. 1. Tanner krygsveld, 21. 2. Andy Yu, 26. 3. Alejo Di Blasi, 55. 4. Robert Richards, 59. Red Fleet: 1. Winn Majette, 38. 2. Caroline Sibilly, 44. 3. Katherine Majette, 58. 4. Tiare Sierra, 60. Green Fleet: 1. Coby Fagan, 19. 2Victoria Rowlette, 32. 3. Amanda Plaxton, 41. 4. Matthew Grayson, 55.